Musician Jack White made a special appearance Sunday at Cincinnati's King Records. 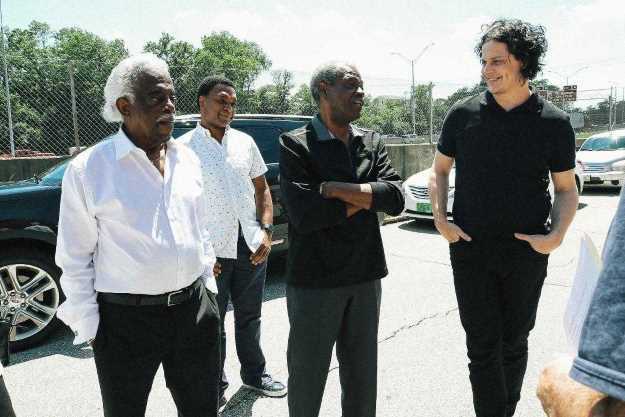 The ex-White Stripes leader rubbed elbows with King legends and walked where James Brown and his band The Famous Flames recorded their first single "Please, Please, Please" in 1956. White came to fame in 1997 with his band The White Stripes with hits including "Seven Nation Army" and "Fell in Love With a Girl." He has since gone solo as a musician and producer. Mayor John Cranley handed the ex-White Stripes leader a key to the city outside the former King label headquarters at 1540 Brewster Ave., Evanston. "We are working on major plans to restore King," Cranley said on Twitter. Cincinnati acquired the King Records building in a property swap with Phillip Mitchell, who was seeking to tear the building down. Bootsy Collins, Cincinnati's own funk music legend, was at King Records to greet White. So was original King Records drummer Philip Paul. Paul continues to play at age 85, Collins said. King legend Otis Williams, who recorded under the King label with his band The Charms, was at the gathering. The Cincinnati USA Music Heritage Foundation issued a news release applauding Cranley and White for working to further a King revitalization. Jack White's Third Man Records celebrated King Records in 2013 by revitalizing a lathe record-maker from Cincinnati. The lathe reportedly cut the James Brown hit "It's A Man's World," according to the Third Records website. Others in attendance were King Records Building Non-Profit Steering Committee members: Evanston Neighborhood President and King Studios Chair Anzora Adkins, Bootsy Collins Foundation President Patti Collins, and King Studios vice chair Kent Butts. Later that night, White performed as the headline act for the finale of this year's Bunbury Music Festival at Sawyer Point and Yeatman's Cove.